Sparksey4869 Model Trains: My collection. Here a few shots of my personal collection. Powerline T and and Austrains Y wait with their Austrains cement train as a Rail tractor shunts some Lima modified tankers. Bachmann works van and Ballast tamper wait alongside a Kibri ballast cleaner. While Two Powerline 48's wait with a loaded AR Kits ballast train. Another view of the same train. The steel train passes a TrainOrama 930 hauling a BGB AHDL wheat train. A CLX in SRA blue. Unsure of the manufacturer. 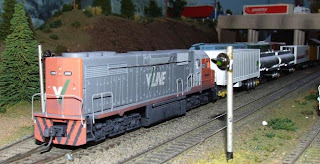 Powerline 81 with Athern mech and TrainOrama 44 haul a cement train of AR Kits NPRY/X. Austrains X, Lloyds DL, Austrains 700 and Powerline G haul a steel train comprising of tarpaulined BGB CSX coil steel wagons. Austrains 80 class with a couple of CLX's. Looks like it could be somko for the workers as the steel train passes by. Two Austrains X class in V/Line Grey and Orange and Powerline 830 in AN green and gold pulling a freighter. The 830 is dummied and there is a TrainOrama VLCX in VR red in the background. 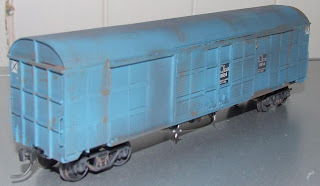 All locos and wagons are weathered and have had Kadees fitted. Austrains 80 class in Tuscan pulling a short phosphate train. 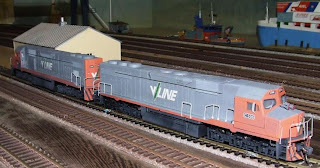 The 80 has diecast pilots and brass hoses, there is a Railmotor Models JAF in VR red, and two Hanovale ARX hoppers. All are weathered. Austrains C class in V/Line Grey and Orange pulling a trailerail. The trailerail consists of tautliners, tankers and refrigerated trailers. Lima Brake van in AN Green and Gold. The only modifications are Kadees, extra weight and weathering. Two Austrains C class in V/Line Grey and Orange. The only modifications are Kadee couplers and weathering. 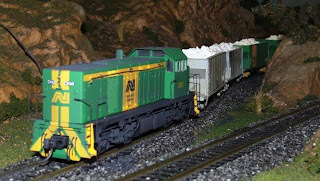 Austrains CK5 in AN Green and Gold pulling BGB stone hoppers with removable cast loads painted SAR Grey and AN Green and Gold. These have all been weathered.